November 2018 marked a generally solid and otherwise unremarkable month for the U.S. stock market's dividend payers. And with that being the case, we took advantage of the opportunity to do some minor rework to the main charts we present in our "Dividends by the Numbers" series. The main change here is that we're revising the threshold for the number of dividend reductions that corresponds to recessionary conditions being present in the U.S. economy. This change reflects the addition of a number of oil and gas royalty trusts (mainly related to new oil shale drilling firms) whose stocks began publicly trading circa 2011-2012, and whose dividends are paid out monthly as a fixed percentage of their earnings rather than being set independently. That latter operating characteristic adds some additional noise to the number of dividend increases reported each month and, given their usually much lower quantity, quite a lot of additional noise to the number of dividend cuts announced each month. 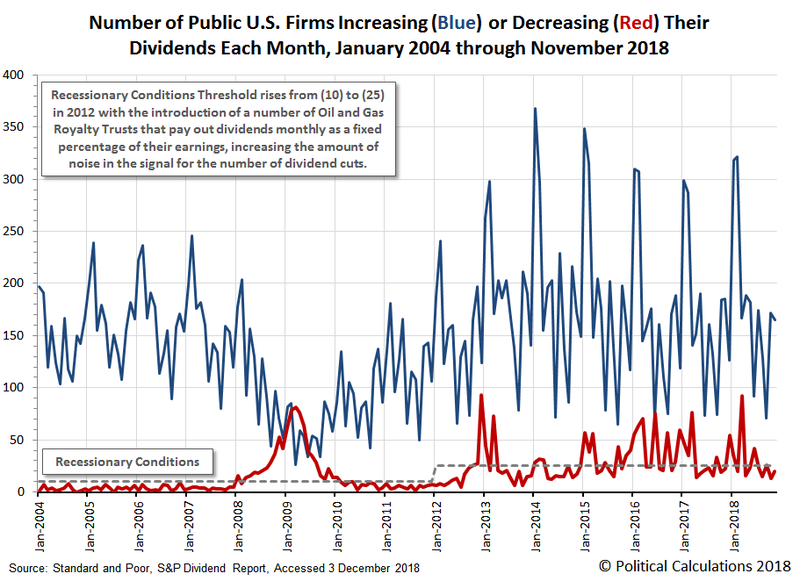 To compensate for the much increased level of noise in the number of dividend cuts announced each month since January 2012, we've raised the threshold indicating recessionary conditions being present in the private sector of the U.S. economy from 10 to 25. Our next chart zooms in on just the lower portion of the first chart to focus only on the reported number of dividend cuts. 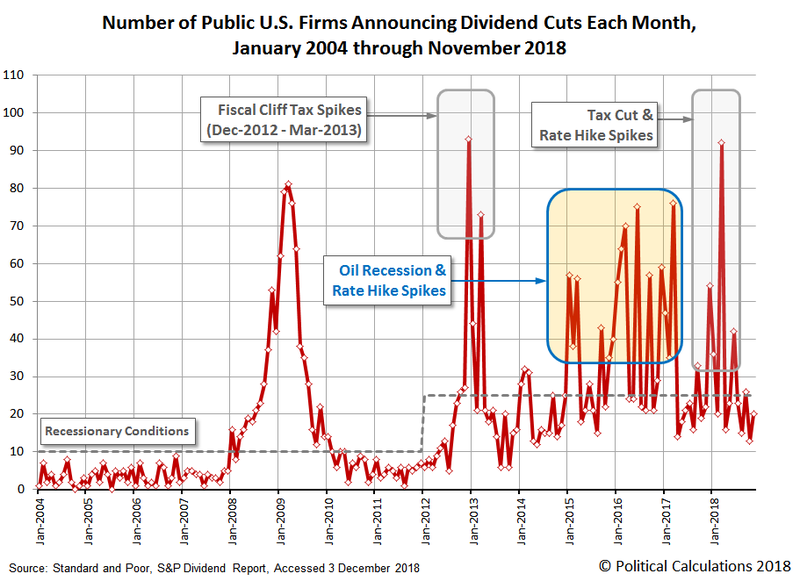 Following the so-called "Great" Recession, an elevated number of dividend cuts has been associated with two main phenomena: economic distress or changes in tax policies. Economic distress is self-explanatory, where when the business environment for companies dims to the point where they struggle to earn profits or to sustain the cash flow needed to pay out dividends to their shareholders, dividends get cut, which is what makes this measure a very simple indicator of the health of the economy.